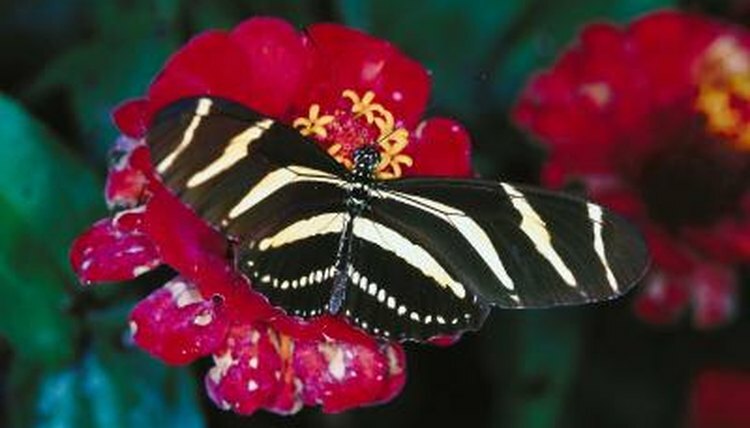 The zebra longwing butterfly (Heliconius charithonia) lives throughout Central America, Florida and parts of Texas. They frequent moist tropical forests and surrounding fields and are active year round. During the warm summer months, they fly as far north as South Carolina, although they cannot endure winters at that latitude and must return to more tropical habitats. This butterfly’s name comes from its long narrow wings, which are black with pale yellow stripes. These bold colors are a warning to predators of the butterfly’s toxicity. An adult has a 3- to 4-inch wingspan and long black antennae. A zebra longwing caterpillar has a white body covered with long black spines. Female zebra longwing butterflies mate as soon as they’ve emerged from their chrysalis. Males often stake out a female’s chrysalis and mate with her as she's emerging. During mating, the male secretes a chemical on the female’s abdomen that keeps other males from trying to mate with her. After mating, the female lays between 5 and 15 eggs on the leaves of passion flower plants. The caterpillars consume the leaves, and the plant’s toxins give the butterfly its toxicity. They develop from egg to adult butterfly in about three weeks. Unlike other butterflies, zebra longwings consume pollen as well as nectar. The protein-rich pollen provides more nutrients than nectar alone and is credited as the reason for this species’ longevity. While other butterflies live only a few weeks, zebra longwing butterflies live several months. At the same time, because they consume pollen, they are more dependent on the presence of plentiful flowers than other butterfly species. A zebra longwing butterfly is slow and calm in flight. When disturbed, they wiggle their bodies to make a creaking sound, but they are not easily startled. These intelligent insects remember their favorite food sources, and will return to the same plants each day to feed. At night, they roost together in groups of 25 to 30 adults. A social hierarchy dictates that the oldest butterflies in each roosting group have priority to select the best spots to roost.